The Bertha Justice Initiative’s first Global Convening in Cape Town in March 2014 generated thought-provoking discussions among women from across the network about what it means to be a woman working as a lawyer in public interest law and the challenges it brings personally and professionally, within one’s own organization and outside it. Despite the diversity of our Bertha fellows’ and partner lawyers’ backgrounds and nationalities, we discovered we had shared many common experiences and had faced common obstacles. The fellows wanted to continue that discussion to find ways to address the challenges they face and to offer each other support and solidarity through Bertha’s global network. To facilitate this process, the Bertha Justice Initiative brought together an outstanding group of women human rights lawyers, both fellows and partner lawyers, from countries as diverse as Colombia, Germany, India, Mexico, Philippines and South Africa. 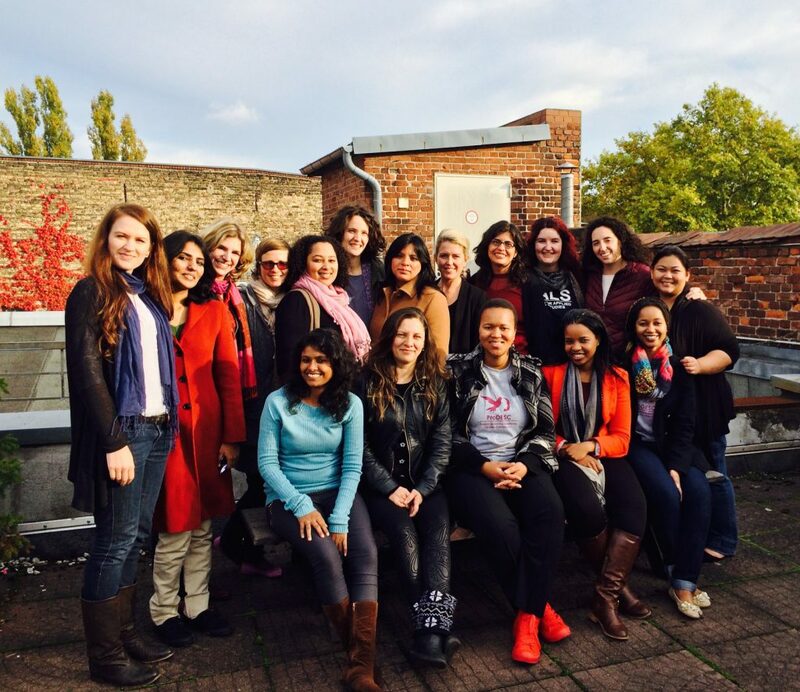 The first gathering of the Women’s Working Group (WWG) was held on 12-16 October 2014 in Berlin and was generously hosted by our German partner organization, the European Center for Constitutional and Human Rights (ECCHR). The meeting in Berlin was a great success. It provided a safe space to share stories and discuss the difficulties we face as women in the law and what can be done to deal with these problems. It was striking how similar the personal and professional challenges that women lawyers face were in different parts of the world. Many had suffered gender-based discrimination before the courts and in their dealings with state institutions on behalf of their clients. Conducting human rights litigation is a challenge in itself – taking on state and corporate power and challenging structures of patriarchy and capitalism – but women lawyers face additional challenges by virtue of their gender. Under-representation is not the only challenge that women lawyers face in their work. It also brings specific gender-oriented threats, which make many women leave the legal profession. As Alejandra Ancheita, Executive Director of Bertha partner Pro DESC and 2014 Martin Ennals Award laureate, noted, ‘in Mexico, women human rights defenders are subject to threats, surveillance and even sexual violence.’ Alejandra has herself been the subject of threats, including death threats and threats of sexual violence. Such open discussions and sharing of personal stories helped us all to become much more mindful of the gender-based discrimination around us, which we often tend to ignore. As Ethel Avisado, Bertha fellow at CenterLaw in the Philippines, said, it helped her ‘to realise we are wrong in taking it for granted that we are sensitized to gender issues and that we need to take proactive steps to challenge it.’ The WWG gathering allowed us to brainstorm and develop strategies to more effectively tackle discrimination and think about how the Bertha Justice Initiative can support and empower its women fellows and advance gender diversity and sensitivity through our network. 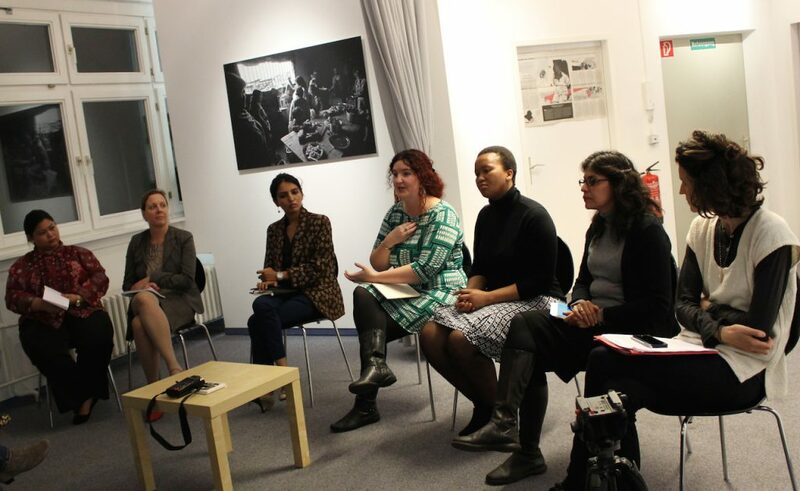 From left to right: Ethel Avisado (CenterLaw), Isha Khandelwal (Human Rights Law Network), Julia Duchrow (Brot fur die Welt), Lisa Chamberlain (Centre for Applied Legal Studies), Nomzamo Mati (Socio-Economic Rights Institute of South Africa), Alejandra Ancheita (ProDESC) and Claire Tixeire (ECCHR). During this same week, ECCHR hosted a public panel discussion “Being a Radical Female Lawyer: Challenges and Vision”. Alejandra Ancheita from Mexico, Lisa Chamberlain from the Centre for Applied Legal Studies, Nomzamo Mati from the Socio-Economic Rights Institute of South Africa, and Isha Khandelwal from the Human Rights Law Network (HRLN) in India participated in the panel which was moderated by Bertha Fellow, Ethel Avisado from CenterLaw and Claire Tixeire from ECCHR. Each participant made compelling contributions on what it means to be a radical female lawyer in patriarchal societies and male-dominated legal environments. 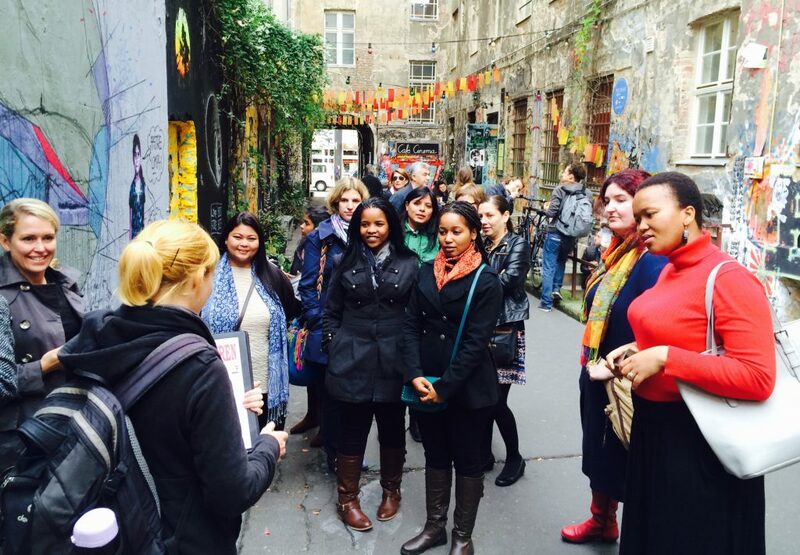 To mark International Women’s Day on 8 March 2015, we will be publishing a short video documenting the Berlin event – including interviews and testimonies from women lawyers from around the world – which will be followed by blog posts from some of our fellows reflecting on their experience. Event participants are also contributing to a joint publication that will be published in the coming months.